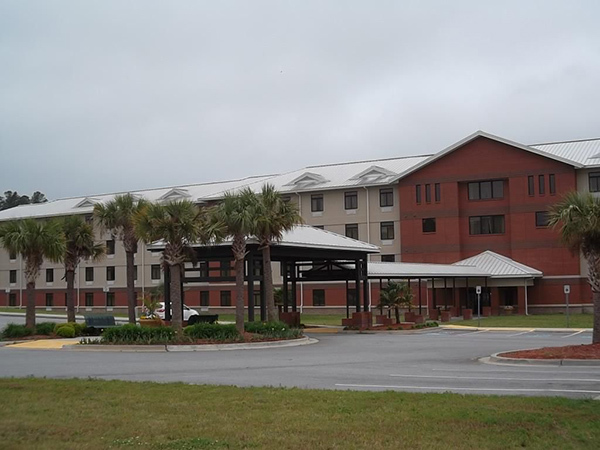 The Jackson Inn is an IHG hotel located at Fort Jackson, one of the U.S. Army’s main production center for Basic Combat Training. Fort Jackson is home to 3,500 active duty Soldiers and their 12,000 family members, who are assigned to the installation. Paragon was contracted to remove and replace all flooring throughout the hotel, install new IHG/Army Hotel Holiday Inn Express monument and directional signage, and repair, reseal, and restripe the parking lot surface. Paragon Construction also renovated the hotel’s lobby, breakfast room, and business center and replaced the FF&E in all 207 rooms at the Jackson Inn. Renovations also included life safety upgrades on over 500 rooms at this location across all the hotel buildings there. © 2017 All Rights Reserved. Paragon Construction Company, LLC.